The Wayne HealthCare surgery team learns about Mako, which is used in knee replacements. 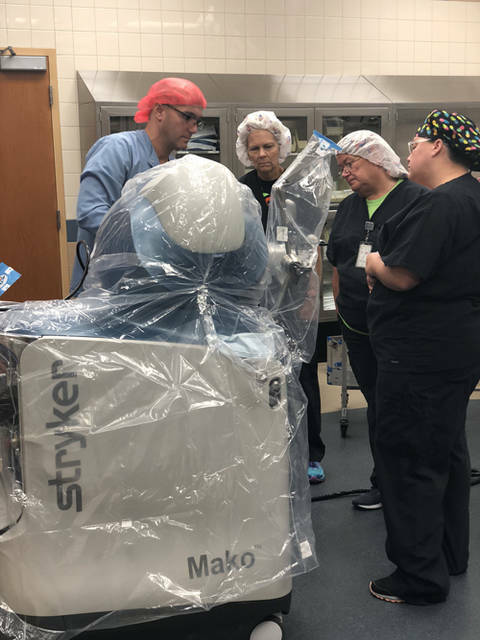 GREENVILLE – Wayne HealthCare is the first hospital in the West Central Ohio and Dayton regions to offer Stryker’s robotic-arm assisted total knee application for use with its Mako System. The Mako Total Knee combines Stryker’s advanced robotic technology with its clinically proven GetAroundKnee (Triathlon Total Knee System), to enable surgeons to have a more predictable surgical experience for patients. “Mako is changing the way joint replacement surgeries are performed by providing each patient with a personalized surgical experience based on their specific diagnosis, pathology and anatomy. More importantly, the Mako robotic-arm assisted technology is a new and progressive type of technology that takes the human error out of the necessary bone cuts during surgery,” said Chad Weber, DO, FAOAO of Orthopedic Associates of Southwest Ohio. “Orthopedic Associates of Southwest Ohio is excited to partner with Wayne HealthCare to be the first in the area to offer this transformative technology for knee replacements. Stryker’s robotic-arm assisted application will allow implants to be precisely aligned, which will lead to great patient outcomes and longevity of knee replacements,” Dr. Weber said. Using a virtual 3D model, the Mako System allows surgeons to create each patient’s surgical plan pre-operatively before entering the operating room. During surgery, the surgeon can validate that plan and make any necessary adjustments with hands on guidance of the robotic-arm to execute that plan. Wayne HealthCare will host a community open house from 2-4 p.m. March 9 to celebrate this new technology. Attendees will have the opportunity to meet Dr. Chad Weber, tour the surgery center and meet the Mako robot. To learn more about the Mako Robotic-Arm Assisted Technology visit waynehealthcare.org/robotics or call 800-824-9861.